The “236” leading to Big Basin outside San Francisco narrows from two lanes to what can generously be described as one and a half. The surface is a “squirm” of tar snakes, wetted to slickness by the morning marine layer. Corners fold on themselves, radii decreasing and elevations changing. Detritus litters the roads. I should be fretting and it’s true I need a change of shorts… because the 2008 Ducati Hypermotard 1100 S has me peeing myself laughing. Riding quickly, in these conditions, has become a game. Bologna’s latest dances through the corners like a child with ADHD spun up on three cans of Redbull. I’ve no desire to dose it with the Ritalin as we flit between lines, skittering around tar snakes, nipping around debris, and tracking between dry patches. For the first half-hour it’s hard to get used to the Hypermotard’s utterly responsive nature. It’s so agreeable to being tossed around it’s disturbing. If your inner ten-year old hooligan got out the Crayollas and designed a motorcycle likely it would look like a BMX with a whopping engine… Which is exactly what Ducati showed us in Milan last year. With the Hypermotard, the dirt ends with the looks though. This is as pure a road going hellion as they come. The front Marzocchi 50mm USD forks and rear Ohlin shock are working hard. The suspension setup isn’t plush but nor is it hammering – a near perfect mix that provides exceptional road holding and agility. Occasionally the rear Diablo Corsa III slides a bit on the slick seal-coating and a foot touches down motard style – driving home two facts. 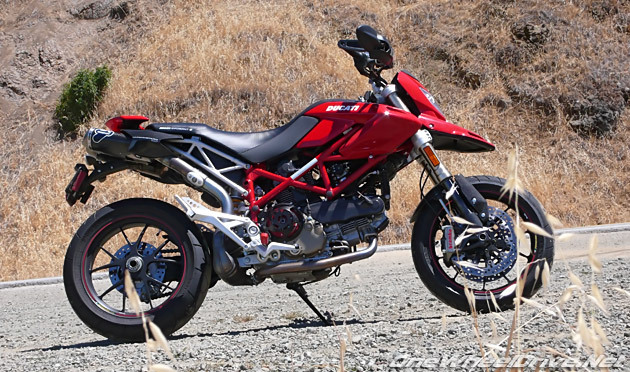 The first, the Hypermotard, at a claimed dry weight of a mere 177 kg / 390 lbs may be “Multistrada derived”, but that Multistrada must have come down with anorexia and the result is preternaturally flickable. The second is that I wore the wrong boots for the job; such is the Hypermotard’s cornering enthusiasm that the soles and edges of my touring boots are burning away… quickly. The sun periodically breaks through the layer of marine mist and the trees, drying stretches of road. Here the ride style switches from Motard-esque to full on sport. Shoot into corners barely using the phenomenal braking power of the Brembo Monobloc stoppers to burn off speed. A system, which sees each caliper created from a single casting, rather than the conventional two-piece construction, increasing rigidity and providing world-stopping power. Hang-off, knee out, weight the pegs, the Hypermotard heels around ready to shoot out of hairpins. 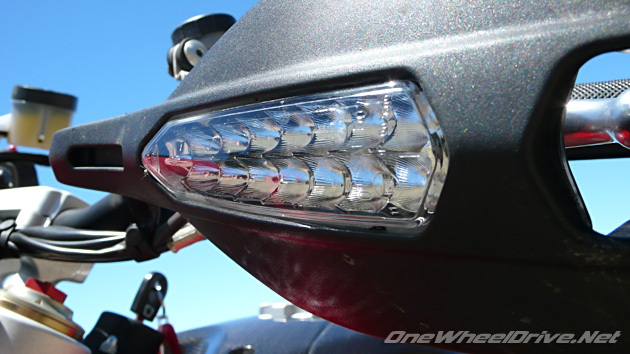 Roll on the throttle coming out of the turn and the front wheel eases off the ground as the 1078cc plant, lifted from the Multistrada, pounds out torque. shout like a rampaging Orc with a bull-horn. Later today in the parking lot of Alice’s Restaurant a fellow rider asks me, “Does it have enough power?” At 90hp stock, the Hypermotard isn’t drunk with power… it has intoxicating handling instead. Even with the twin Termi sonic canons our test Hyper is likely still aspiring to 100hp, is that enough? Absolutely! If you’re seeking weaponized power in motorcycle form then you’re missing what the Hypermotard is about; corners, twists, and giggling like you’ve taken a good hit nitrous with a chaser of speed. The afternoon hits, its warmth burning away the marine layer, drying the roads, and fuelling the pace. The Hypermotard continues to impress and the edges of my size 12 feelers are grazing the pavement periodically. 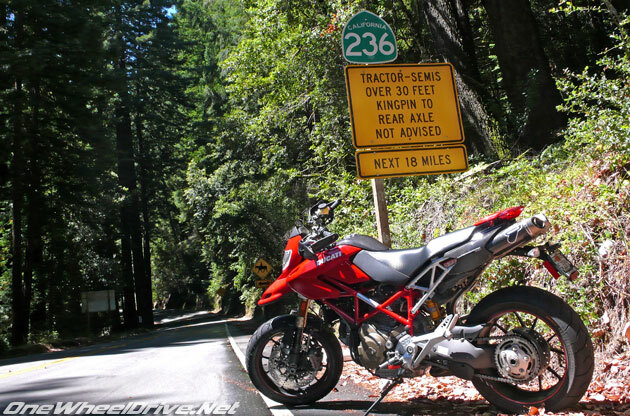 I’m hard pressed to think of a better place to test the Hypermotard than the outside San Francisco; Skyline Road seems relaxed and sweeping and its 1 1/2 to 1 lane tributaries dribbling down mountain ridges technical riding paradises – their convolutions invoking paroxysms of throttle twisting laughter. Would this bike be as much fun elsewhere? The track – definitely! Beyond that the question is open to debate. On the freeways the Hypermotard is out of it’s element, but not uncomfortable. It is a warm sunny day and the air-stream over the barely existent gauge cluster is clean and turbulence free, 60-70mph (100-115kph) is surprisingly comfortable. Open the throttle and by the 8.5-grand redline the Hypermotard in ripping along at 85mph (135kph) – it’s a fight with aerodynamics. On California’s freeways where cars are whipping by me at 80-plus that’s a bit of an issue. The relaxed ergonomics of the Hyperrmotard, like that other “Mega-Standard” the KTM 990 Superduke, can almost beguile you into thoughts of touring. Some pertinent factors come into play. For example, the lack of wind protection in heavy weather. The limited range offered by the miniscule 12.4-litre tank; work the 1100 hard and you can see the range plummet to 70 miles (112km). That range may be workable in Europe where the distances between stops are shorter, but map a route through the Canadian Rockies and you’ll be bringing a gas can. Then there is the vibration, it’s low frequency and high-amplitude, but felt through the bars and pegs constantly and after four hours of testing I was well ready for a break from it. Back in Cupertino I’m gleefully cutting through traffic (the dry clutch is a bit heavy so I’ve an excuse for lane splitting) and the impish Hypermotard is delivering more surprises. 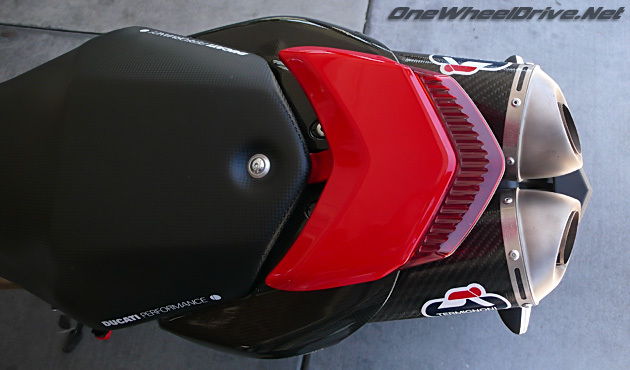 The bar end mirrors, which fold away for track days, are remarkably effective. They are a bit wide for squeezing between SUVs, but if you’ve declared war on the planet and bought a Hummer consider the scratches karmic payback. The seating position gives you excellent visibility to boot. And well, I’m not a wheelie guy… honest, but pulling the front end up seems remarkably easy – if one were to even vaguely try. Does the 2008 Ducati Hypermotard live up to the “hype”? I’d tell you, “no”. I’d tell you that, “This bike doesn’t have a playbook composed nearly entirely of hooligan antics.” I’d tell you that, “It doesn’t have a racing soul.” But I’d only tell you those things if it means the Hypermotard you have on order is up for grabs… So, which dealer was that order at now?